Dermalactives Eye Cream Review: Does This Eye Cream Really Minimize Puffiness And Prevent The Signs Of Aging? What is DERMALACTIVES EYE CREAM? Dermalactives eye cream review, this is a daytime cream formulated to nourish and pamper the delicate skin of the eye area. It is a highly active product that claims to minimize puffiness, restore healthy skin, and prevent the signs of aging. These effects said to be mainly due to the brand’s advanced collagen formula, which helps stimulate the production of collagen in the deeper layers of the skin while also conditioning the skin’s surface to make it look younger, healthier, and more radiant. 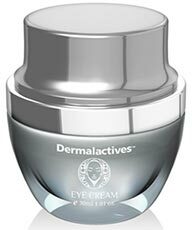 This eye cream is available at Dermalactives’ official website. It can also be purchased through other online retailers. As with any other products of the brand, it is a bit pricey too at $320 for a 30ml jar of cream. WHO MAKES DERMALACTIVES EYE CREAM? The Dermalactives Eye Cream is developed by the organization Dermalactives Cosmetics. The company has a good reputation. Dermalactives Eye Cream has produced various advanced lines of cosmetic products and anti-aging. Manufacture claim that their products developed using extensive research to get the best results through the usage of better ingredients and their products do not cause any sensitivity reactions. How does DERMALACTIVES EYE CREAM works? Based on dermalactives eye cream reviews, this cream fights the signs of aging around the eye area by nourishing and moisturizing the skin on it. It also repairs skin damage by inducing collagen production in the deep layers of the skin. Using this cream on a daily basis along with the eye lifting solution will give great results. Glycerin – works mainly as moisturizer; it also has skin healing properties and helps treat common skin problems such as acne. Sodium hyaluronate – also called hyaluronic acid, it is a naturally-occurring compound in the body; it serves many benefits, one of which is keeping the skin moisturized, plump, and soft. Retinyl palmitate – a form of vitamin A commonly found in many hair, makeup, and skin care products; it gets rid of dry, damaged skin by moisturizing the skin and restoring its suppleness. Vitamin E – an antioxidant vitamin whose main role is to fight free radicals that cause damage to the cells which, in turn, results to aging. Hydrolyzed collagen – stimulates the body’s production of collagen. Hydrolyzed elastin – helps nourish, moisturize, and protect skin; its great moisturizing effects make it extremely suitable for combating dry, flaky, and mature-looking skin. Algae extract – also referred to as “seaweed extract,” it provides a variety of benefits which includes skin moisturizing, conditioning, nourishing, and detoxifying to name a few; it is also rich in antioxidants, which help get rid of free radicals. Its complete list of ingredients is shown in the brand’s official website. According to experts dermalactives eye cream reviews, It minimizes the signs of aging on the delicate skin of the eye area. It nourishes, conditions, and moisturizes the skin. It is safe and suitable for everyday use. Based on user reviews, the product has no side effects. It is available for purchase on Dermalactives’ official website. Users dermalactives eye cream reviews, It is more expensive than most eye products. The product works best when used with the equally-expensive Dermalactives eye lifting solution. There is no money-back guarantee or free sample offers. Based on experts dermalactives eye cream reviews, Dermalactives Eye Cream is best used with the brand’s eye lifting solution. To use these products, start by washing your face and patting it dry. Apply the eye lifting solution first. Gently rub the product on the eye area until fully absorbed by the skin. You can now apply the eye cream using small circular motions. Make sure that either product does not contact the eyes. In case of accidental contact, rinse your eyes immediately. For best results, use this combo on a regular basis. Expert dermalactives eye cream review, dermalactives products in general, are proven to be safe for daily use. This claim of safety is backed by customers who have tried the product. No free samples are offered, so you have to buy the product to be able to try it. This, however, is impractical due to the price of the product. In such case, it would be best to just look for another product like the ones suggested below. Yes. Be cautious to deflect the cream from coming into touch with eyes as it may have an annoying outcome. Dermalactives Eye Cream has received mostly favorable reviews from its users. Most of them claim that the product is magnificent and remarkable, as it indeed made their eyes look more youthful. Take note, however, that these reviews are found on the Dermalactives' official website. As always, the best way to know for sure is if you try the product yourself.